While Maine is known for lobster feasts in summer and spectacular Maine foliage in the fall, the colder months are no less exciting in the inland mountain region where more than two dozen ski areas and resorts beckon skiers, snowboarders, and snowtubing enthusiasts each winter. Maine is wide open country during the peak of the ski season offering some of the best and uncrowded ski areas and resorts on the East Coast. While Sugarloaf may be known the world over as the state's premiere ski resort, Maine offers everything from family friendly ski runs to state of the art snowboard terrain to weekend getaway fun for couples and singles. With a 4,265-foot elevation and a 2,820-foot vertical drop, Sugarloaf continues to draw loyal fans to its on-mountain lodging and incredible vistas, along with its alpine park, shops and restaurants. Stay awhile and relax in its indoor pool and learn a few tips and tricks from the masters at Sugarloaf's ski school, geared to everyone from beginners to experts. Sunday River, located near Bethel or about 1 1/2 hour's drive from Portland, has its own claim to fame offering "8 mountain peaks and endless skiing". Dotted with lodges at the base, along the slopes, and 1 mountain top hotel, Sunday River hums with activity from late October to spring featuring a 2,340 foot vertical, snowboard park as well as glade skiing. Big Rock Ski Area is another popular winter location in Aroostock County (about 2 1/2 hours from Bangor) offering a "small town feel with big mountain skiing" including a cozy lodge and restaurant, cross-country and snowshoe trails all affordably priced for a fun family day out. Ski Maine - "Information central" for ski resorts & lodges including hotel & accommodation booking, snow reports, maps & photos, event calendar, trip planner, related news and resources. 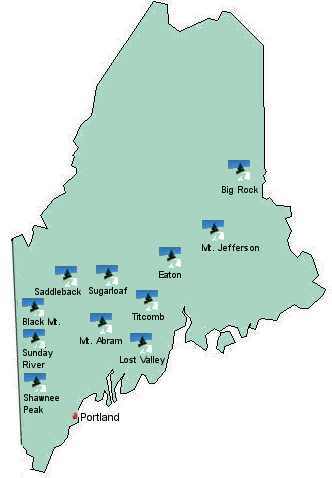 Maine Ski Areas - Check out a complete directory of ski resorts within the state with descriptions and directions, photos, contact info. Maine Ski Reports, Snow Conditions & Weather - Plus overviews of major resorts with details on trail openings & closings, average base depths and current surface conditions, maps & photos.